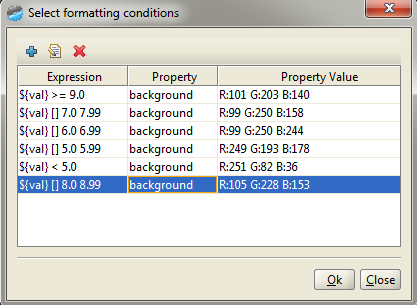 NextReports formatting conditions can be used to highlight some data by changing background, foreground, font and border properties. A very useful application is to generate something like an "Efficiency Meter" or any kind of "Meter". Such meter will show how some entities are found regarding some thresholds. Let's take as an example of our "Efficiency Meter" a call center where different employees are talking with different clients. We set some thresholds for the number of phones per employee to know how they perform. 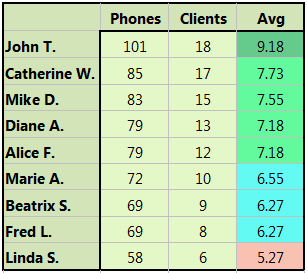 A sample report may show employee name, the number of phones taken for a period of time (in our example 11 hours), the number of clients involved and the average of calls for a period of time (in our example 1 hour). Result shows us in a nice format how everyone performed and it allows us to see in a glimpse if there are ups and downs.